Alright, first of all, it’s hard to find one of these to buy these days. The best we could do is we found the foldable version on Amazon. It’s pretty much the same thing, but it actually folds away for easier storage, so we’ll reference that model throughout the article, as it’s likely what you’ll find on the market to purchase. The Playcraft Sport Foosball table is a decent buy for kids (from about age 7 to 13), or for beginners who want to play casually. It’s not great for adults, since it’s very small and not that sturdy. The Playcraft Sport foosball table is 48 inches in length, 24 inches in width, and 31 inches in height. The height may be a little too short for adults. 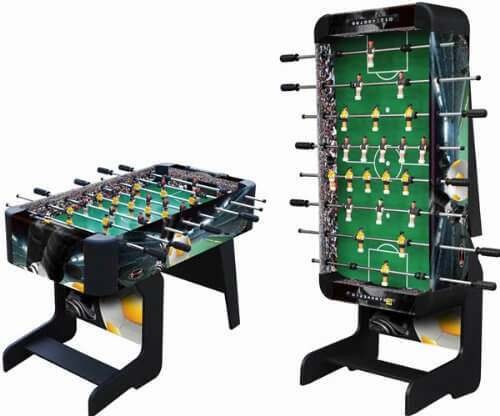 It weighs around 63 pounds and folds up on itself, so it’s absolutely portable, which is rare for a foosball table. The durability of the table is mainly related to its thickness and as the thickness increases, the durability increases (and the price increases). The Placraft table, being light and cheap, isn’t as durable as most other tables, unfortunately, and it has a short warranty to boot. The Playcraft Sport Foosball table is manufactured in China, and although there are fantastic tables made there, the price of this one gives away it’s true quality. Speaking of warranty, it’s only 90 days. Its rods are made from chromium steel which is not bad when it comes to resisting stains and corrosion. Well it’s definitely sporty, but in a 1990s sort of way. It’s got soccer graphics all over it, so it’s definitely not a classic, attractive looking table. The unique folding design gives it a bit more stability on the one end where the large portion touches the ground, but less on the other end. Compared to the original version, which was the same on both sides, it’s probably less stable overall, since it doesn’t have a middle stabilizing bar. Plus, it’s meant to fold away, so it can’t be all that rigid. Foosball tables are typically made to be heavy so they won’t be moved during playing. The benchmark weight of a foosball table is 100 pounds, and this one is only 63 pounds so you can’t count on it being stable or sturdy during gameplay. So it can’t handle aggressive or vigorous gameplay…which is why we said it’s perfect for kids or beginners who aren’t going to spin the handles to death trying to make a crazy shot. The table’s sidewalls are only 5/8 inch, whereas higher-end models are at least 1-inch in thickness, so it falls short of the standard. You can’t really adjust the legs, so it’s not great for putting on uneven ground either. It’s not that big. It’s not that strong. It’s not that sturdy. But for the price…I mean, if you’re buying it for a smaller space or for your kids, it’s not the worse table you can buy. Sorry we can’t say amazing things about it, but at this price point it is what it is. Bonus points for being foldable, though!